This Easter Bunny weighs a whoppingthree-and-a-half stone and is four foot three inches long - making him the biggest rabbit ever recorded. And he still has not reached his full size, with owner Annette Edwards, 59, preparing herself for another six months of growth before he hits full size. Darius gorgeshimself on hay throughout the day which seems to have helped give him an unusual chilled temperament around other animals and humans. 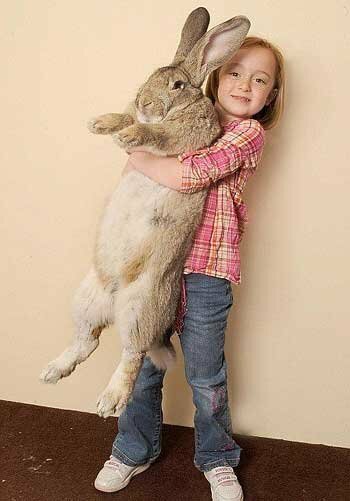 Ms Edwards, from Worcester, has bred big bunnies before but Darius has been recognised as the largest rabbit ever recorded. She said: "I only measured him this weekend and that was when I realised he was much bigger than Alice, who is the current record holder. "He is so gentle and I wonder if this has helped him grow bigger than the rest. He does run around all the time, so I guess the combination of food and exercise has worked out for him. "He really is a handsome beast though, there's always a bit of a glint in his eye when you go near him." Darius is the son of current record holder Alice and the grandson of earlier owner of the crown Amy. Ralph, owned by Pauline Grant, who hit the headlines at the start of the year is his stepbrother but is dwarfed by his half-sibling. Ms Edwards had recently started auditions to find a man to hold Alice at personal appearances around the globe. But now the lucky job applicant will have to have a few more muscles to his name as Darius is much heavier than Alice. Ms Edwards said: "I think it's nice that the record is being kept in the family. The frightening thing is that Darius is still growing so he could be absolutely massive by the time he reaches full size. "People ask me what my secret is, but there really isn't one other than just treating them well and really looking after them." A spokesman from Guinness World Records said: "This is the biggest bunny in the world. Darius is bigger than all the previous record holding rabbits. It's unbelievable that a rabbit could grow to over four-foot long."